​I was lucky enough to get an early copy of Assassin's Creed: Heresy from Ubisoft. Special Thanks to Holly Rawlinson. Full Spoilers for Assassin's Creed: Heresy. Simon Hathaway, member of the Templar Inner Sanctum, brings a cool head and detached manner to his new role as Head of Abstergo Industry s Historical Research Division. And the most dangerous truth of all: Who is the heretic and who is the true believer. Assassin's Creed: Heresy focusses on Simon Hathaway, the new Head of Abstergo's Historical Research Division. Replacing the late Isabelle Ardant, Simon takes the department in a new direction. 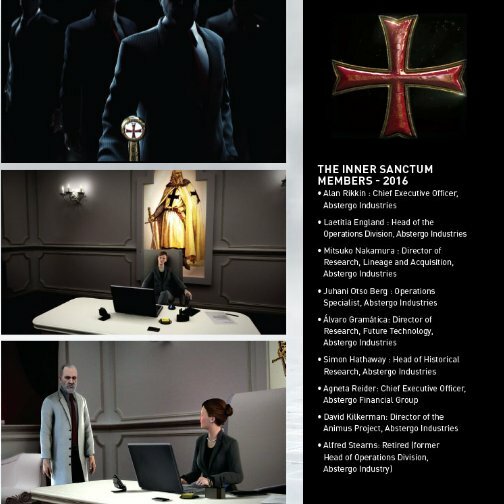 ​Taking his place in the Inner Sanctum, Simon is given clearance by Alan Rikkin to use the new Animus, in a search for knowledge that will benefit the Templar Order. Assassin's Creed: Heresy is extremely well written, uses an extreme amount of detail to set the scene. Although the book looks at the Historical aspects in great detail, it can sometimes become slightly confusing, as many names and characters hold similarities. ​ I really enjoyed the idea that the Animus could be used to find knowledge that could help the present day characters fix broken Pieces of Eden. Simon's proposal to Rikkin at the start gives us a fresh perspective of the many ways in which the Animus can be used. Recently, we have seen the same formula in Assassin's Creed games. Use the Animus to find a Piece of Eden. It was interesting to see a search for knowledge, rather than a search for another artefact. I was especially impressed with the many links to the Assassin's Creed: Abstergo Employee's Handbook (also written by Christie Golden). To finally learn the truth about Robert Fraser, and the reasons for his termination was truly satisfying. Often I feel that Assassin's Creed leaves a lot of questions unanswered, so it was great to finally know the truth. I also really liked the way Heresy made it clear of the date and location of each and every memory entered by Simon. Sometimes the jump between past and present can be confusing, in transmedia material such as the Titan Comics. Heresy made it very clear, helping the audience to understand where exactly we are focussing on. The fresh concept of an Assassin Queen was also a fantastic move for the franchise. Many times have we seen Templars in positions of power, so it was great to see an Assassin Mentor in such a high ranking position. The references to the Isu Precursor Race were also very interesting. The return of Consus, and the Sword of Eden made this book almost feel like a sequel to the lore provided in Assassin's Creed: Project Legacy and Clay Kaczmarek's Animus Glypths. I really liked the way Heresy expanded on previous lore. It's very clear that everyone involved in the creation of this book put a lot of time and effort into avoiding lore inaccuracies and contradictions. The AC Team and Christie Golden did a great job with this book. Joan of Arc could "Glow". Possibly because she had a high concentration of Precursor DNA. Robert Fraser's fate revealed (AC Employee Handbook Researcher). ​Simon's Ancestor, Gabriel Laxart was trained by the Assassins. Simon comes from a Templar family. Gabriel can sense the presence of the Sword of Eden. This ability to sense POE's is rare, and is an ability shared by the Assassin, Giovanni Borgia. This is likely due to a high concentration of Precursor DNA. ​Simon begins to see strange symbols and messages in his sleep. The "Voices" that talk to Joan correctly predict that she will be injured. "Tomorrow, blood will leave my body...... here, perhaps, above my breast........"
Reference to Sofia Rikkin and the Animus project from the AC Movie. "Rikkin stretched out his legs in the back seat of the Rolls, absently watching London zip past as he spoke on the phone with his daughter, Sofia, who was preparing for his arrival in Madrid in a few days." Page 185 explains that she gave Fraser information that was then leaked to the Assassins. She did not know the goals of the Assassins or Templars at the time. Rikkin tells her that she was very close to being terminated, like Aidan St. Claire. (247) "You are in possession of Abstergo property. Hand it over and submit to judgement!" Simon escapes Abstergo and sneaks into the Inner Sanctum Meeting! Otso Berg defends Simon right to a fair hearing. Jacque de Molay had hidden the Heart in Coudray dungeon behind the symbols on the wall. Joan had kept the "Heart" in a pouch around her neck, and it acted as a power source! When Joan was burned, her executioner had thrown the "heart" into the river Seine. Simon managed to find "The Heart" by sensing it's presence at the bottom of the river Seine! The Templars have a secret group called "Omega Team" standing by.